Vishnu Dhama Only Vishnu Dhama, abode of Lord Vishnu is complete now. It is open to public for visits and events. Vishnu Dhama as the name suggests, is dedicated to Lord Vishnu. 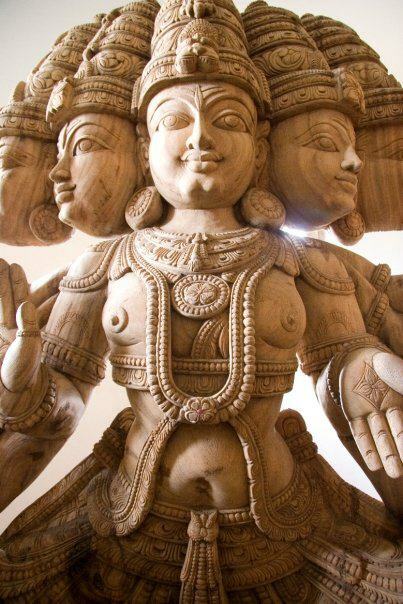 However, as is customary in many Hindu temples, a pantheon of other gods and goddesses also adorn Vishnu Dhama. Exhibits in Vishnu Dhama are described below. Level 0 – Char Dham or Chaturdhamas As you enter Vishnu Dhama, the main ornate portico represents Char Dham or Chaturdhamas (four abodes) of Lord Vishnu. In it, on the columns and arches of the portico, you will see stories of the four of the most holy places of Lord Vishnu in India, namely Rameswaram (Lord Rama), Puri (Lord Jagannath), Dwaraka (Lord Krishna), and Badarinath (Lord Narayana). Level 1 – Ayodhya At the top of the stairs at the main entrance is Ayodhya. Embellishing an entire wall, carved in stone, there is the life story of Lord Rama, including his birth on earth, his Vanavasa (life in the forest), abduction of Sita, defeat of Ravana, Sri Rama Pattabhishekha (Lord Rama’s coronation) etc. 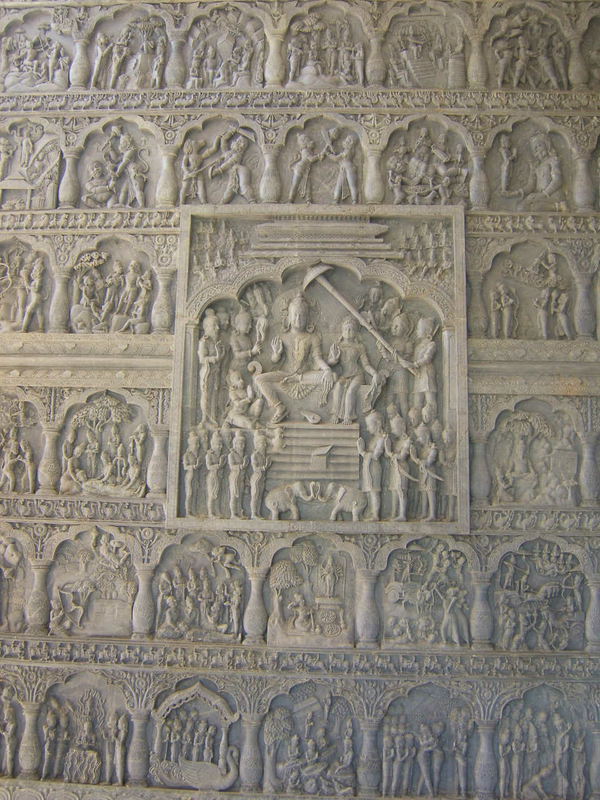 The entrance door in Ayodhya, which leads to Tirumala, is carved with scenes from celestial marriages. Meenakshi Kalyana, Laskshmi Kalyana, Saraswati Kalyana, Srinivasa Kalyana, Rukmini Kalyana, and Shanmukha Kalyana and other weddings are shown here. Level 1 – Tirumala Upon entering the main foyer of Vishnu Dhama, you will be in Tirumala. The entire story of Lord Venkateshwara of Tirupathi is carved in serpentine stone on the walls and arches. In an adjoining space, adorning the walls, you will see beautiful stucco sculptures bringing to life some of the stories of Lord Krishna, including a captivating artwork of Geethopadesha (imparting the knowledge of Geetha) and Vishwaroopa (cosmic universal form of the Lord). Tirumala has a big collection of Tanjavur (Tanjore) paintings, which are gilded and studded with semi-precious stones. Also, when you are in Tirumala, do not miss the two stone statues of Lord Sudarshana and Lord Dhanvantri, and definitely make sure you see the shrine created for Lord Keshava. To the right side of Tirumala is Karmabhoomi, a little memorial created for Shri GK Ananthram, the visionary founder and creator of Omthara Kala Kuteera. Karmabhoomi signifies a place where we do our karma, i.e., duties, and it is a befitting name for the memorial of a person who worked tirelessly every day from the tender age of eight years to his very last days when he was eighty-four years old. Level 0 – Brindavan The level below Tirumala is Brindavan. As you go down the steps from Tirumala to Brindavan, on the right hand side, you will see Lord Krishna lifting the Govardhana Mountain to protect the citizens of Nanda Gokula from the fierce onslaughts of Devendra, the king of gods. Further down the steps, on your left hand side, you will see Lord Krishna showing the entire universe in his mouth to his mother, Yashodha. 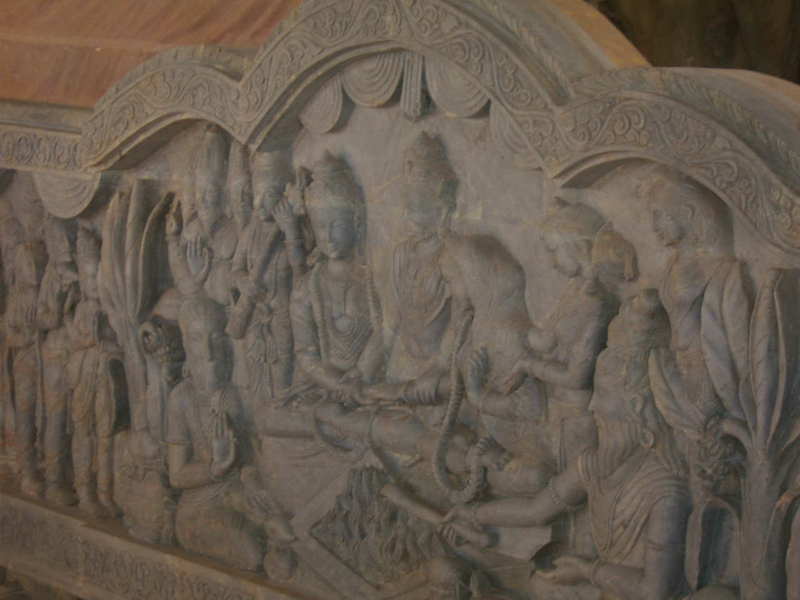 After descending the steps, you will see a large stucco sculpture with Lord Krishna and Balarama being taken by Akrura in a chariot to meet their evil uncle Kamsa. You will see women of Nanda Gokula prostrating in front of the chariot to prevent Lord Krishna and Balaram from goint to Mathura. In the anteroom immediately next to it, you will see another collection of beautiful Tanjavur (Tanjore) paintings that depict Lord Rama and Lord Krishna. Level 2 – Haridwar The level above Tirumala is Haridwar. As you go up the steps from Tirumala to Haridwar, you will see a life size stucco statue of Virata Purusha, the cosmic form of Lord Vishnu. Immediately to the left, near the staircase, there is another life size statue, made of wood. 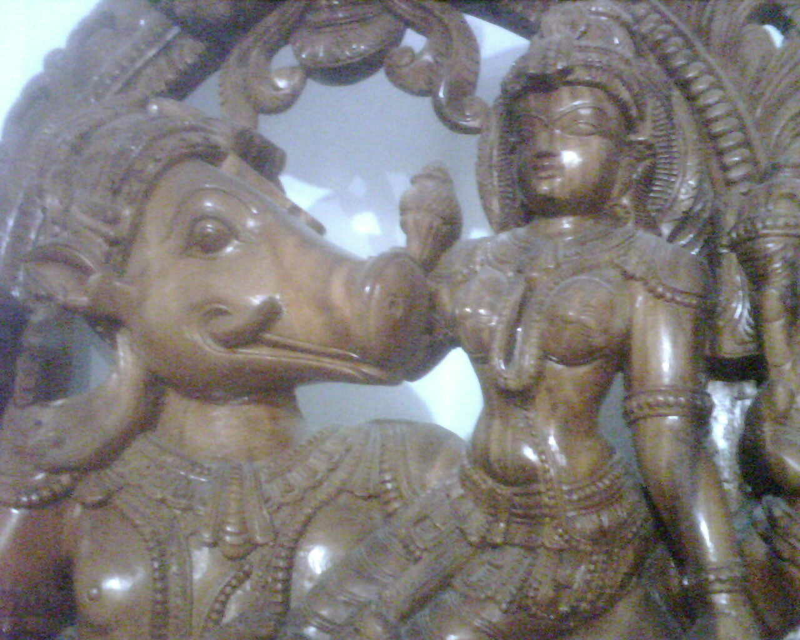 This shows Lord Varaha rescuing Mother Earth from the evil Hiranyaksha. Across the room, you will see a stone wall panel of the twenty-four Archavataras of Lord Vishnu. These are the 24 main forms in which Lord Vishnu is prayed to by Hindus. 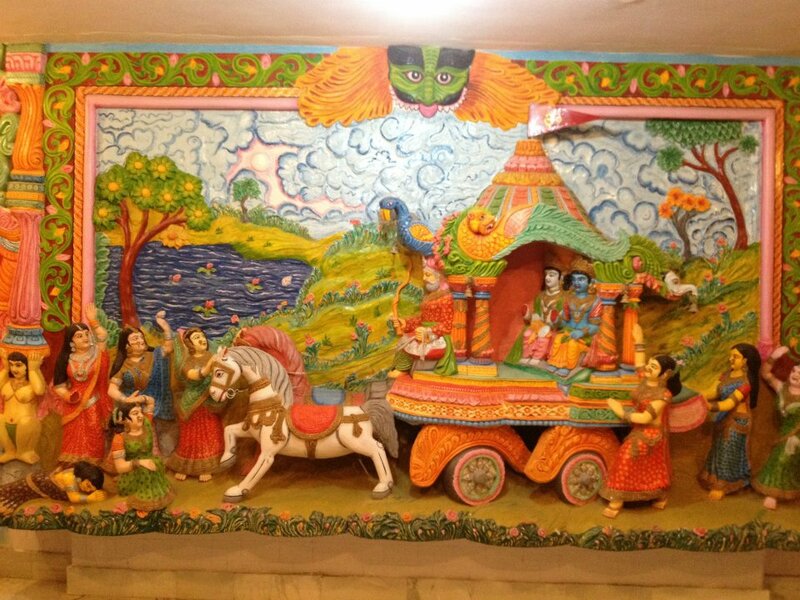 On the other side of the staircase, you will see a large wall fresco depicting several stories from Bhagavatha, which about the life of Lord Krishna. Each panel within this fresco is intricately painted with vegetable dyes, and represents one story from the life of Lord Krishna. Further down, beyond the Bhagavatha fresco, you will enter the Dashavatara room. In here, you will see floor to ceiling and wall to wall size exquisitely carved wooden statues and carved panels, depicting the ten main avatars of Lord Vishnu. Make sure you wait to see the sound and light show to learn about the various avatars. 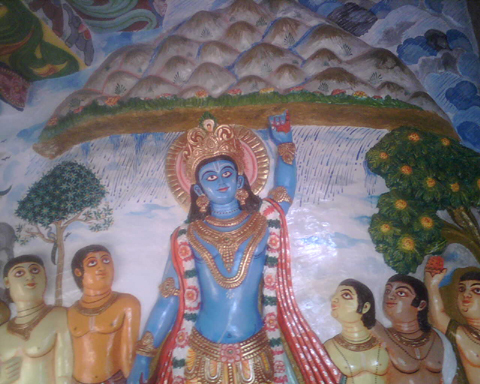 Haridwar also has many smaller frescos on its walls. Most of these show stories of Lord Krishna. One of them shows Lord Krishna coming to the rescue of Draupadi when she is being disrobed by Dushashana in the palace of King Dhritharashra. There is also a fresco showing Mother Durga on the wall adjoining the staircase going up from Haridwar. Mother Durga is said to have the powers of Lord Vishnu, Lord Shiva and Lord Bramha, along with the powers of Mother Parvathi, Mother Lakshmi and Mother Saraswathi. The doors from Haridwar leading out to the portico have exquisite carvings of Ashta Lakshmi, the eight major forms of Goddess Lakshmi. Level 3 – Chidambaram Chidambaram is the level above Haridwar. This level is dedicated to Lord Shiva. As you go up steps from Haridwar to Chidambaram, at the end of the staircase, you will see Tanjavur (Tanjore) paintings of Lord Shiva. One of the paintings, is a large one that shows the 108 dance forms of Lord Shiva. This is a replica of a similar painting from the famous Lord Shiva temple in Chidambaram, in Tamil Nadu. The main attraction of the Chidambaram level are the carved pillars in the open area that the staircase leads to. In here carved intricately on sand stone are the same 108 dance poses of Lord Shiva. Each one is accompanied by a Sanskrit verse that talks about that pose. Chidambaram is the place were Café Annapoorna is located. Make sure you get a bite and reenergize yourself before you proceed to the next level, Arankayaka. Level 4 – Aranyaka The level located above Chidambaram is Aranyaka. 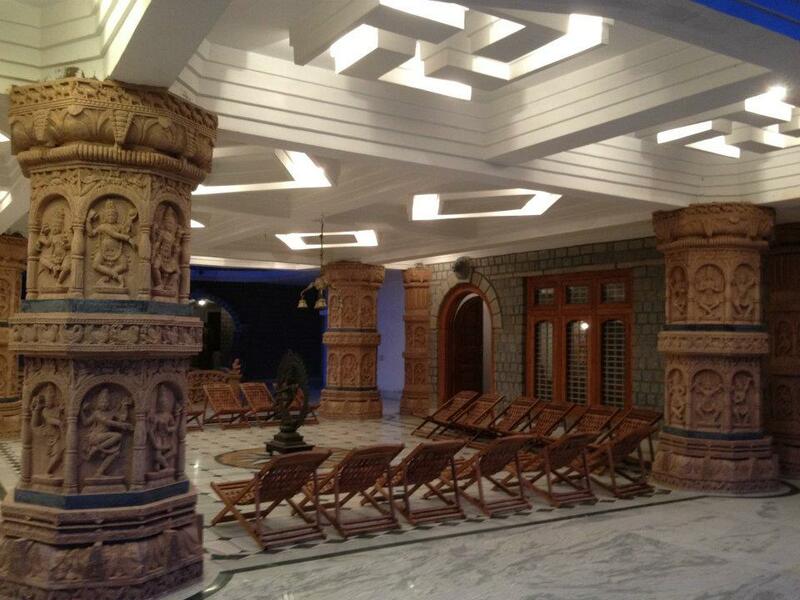 Build in Chettinad style, the flooring of Aranyaka is made of handmade atthangadi tiles. 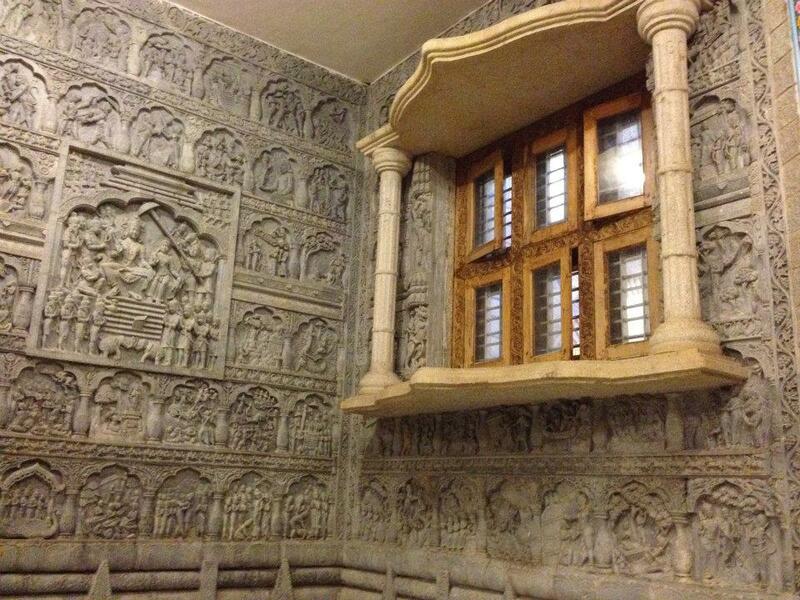 Carved wooden pillars and windows adorn Aranyaka. Lifesize and life-like steel and leather statues of wild animals present at this level is the reason for the name Aranyaka. At Aranyaka you will also see life-size painted wooden statues of Lord Krishna, Lord Rama, Lord Sadashiva, Goddess Gayathri, Goddess Durga, Goddess Lakshmi, Goddess Saraswathi, and other deities. Level 5 – Meru The level about Aranyaka is Meru. It is a pyramidal shaped meditation hall. 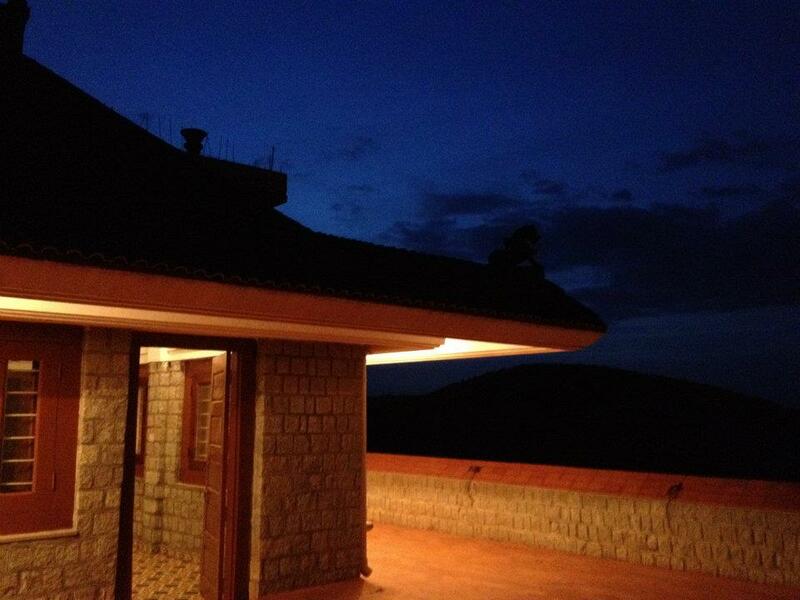 Outside Meru, you can step into the open areas and get a panoramic view of the country side around Omthara Kala Kuteera. Shiva-Shakthi While Vishnu Dhama is dedicated to Lord Vishnu and Goddess Lakshmi, Shiva-Shakthi is dedicated to Lord Shiva and Goddess Parvathi. 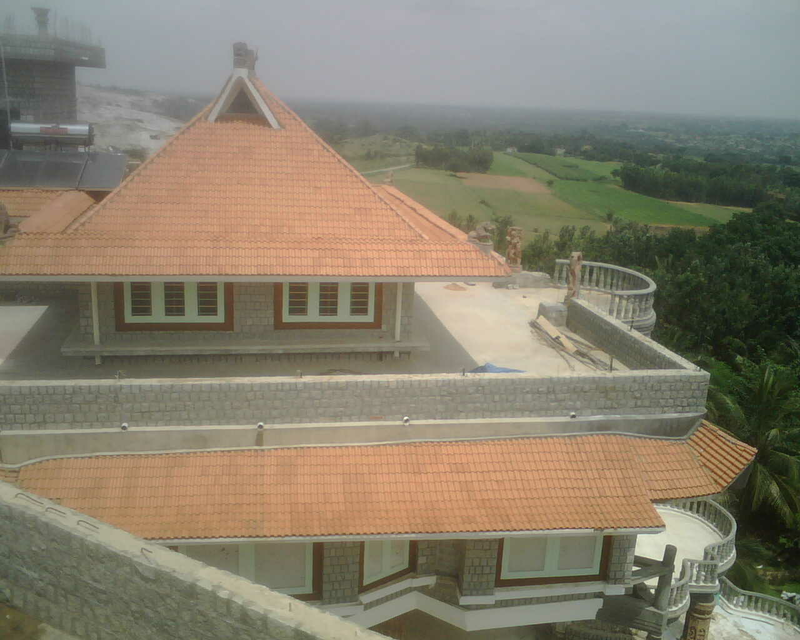 Shiva-Shakthi is under construction at Omthara Kala Kuteera. The exhibits within the finished portions of Shiva-Shakthi includes the various forms of Goddess Parvathi, including Mother Annapurneshwari, Mother Durga, Mother Kali and so forth. Outdoors – Exhibits at Omthara Kala Kuteera are located outside in the gardens as well. 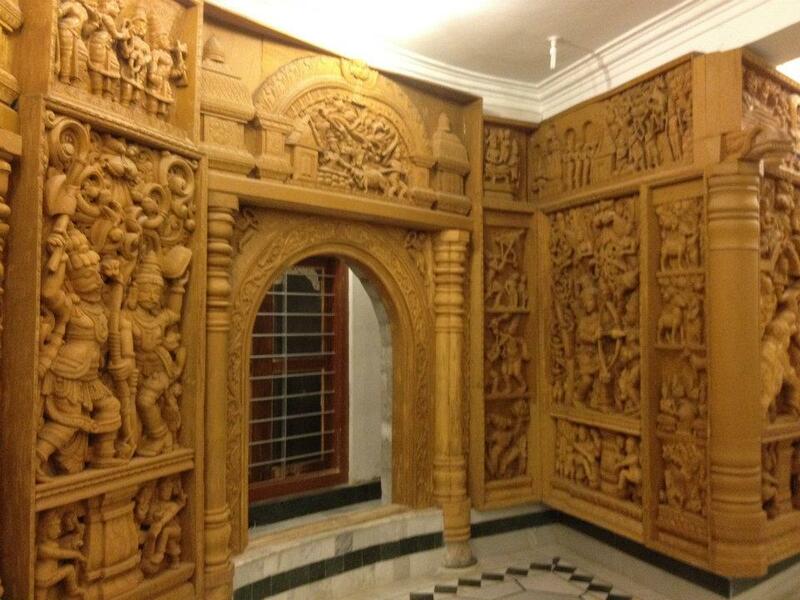 Enjoy the beauty of exquisitely carved man made art, complemented by the beauty of nature. Kashi – In front of Vishnu Dhama is a cute temple like structure supported by a single pillar, with large and beautiful sculptures on the four sides of the pillar. This is Kashi. 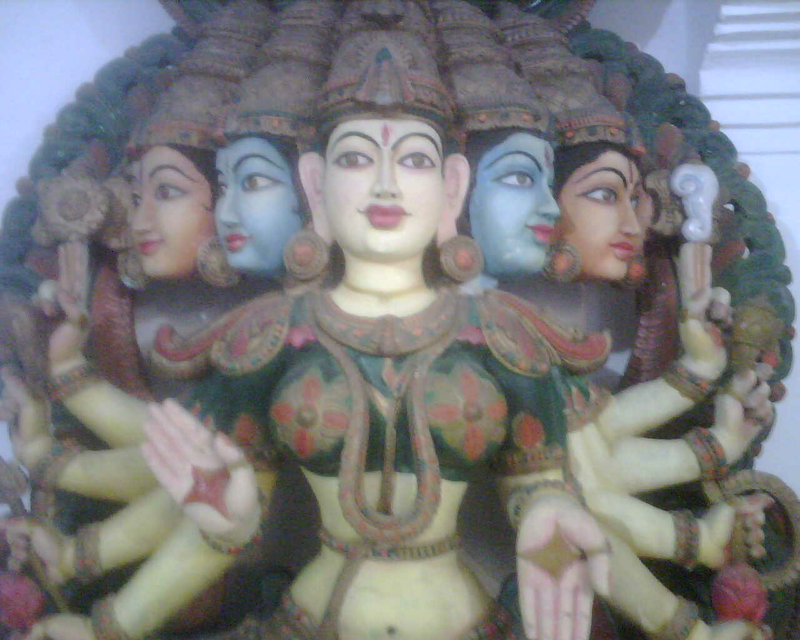 Facing east in Kashi, there is a beautiful sculpture of the family of Lord Shiva. In this Lord Shiva and Mother Parvathi are sitting with their two divine children Lord Ganesha and Lord Muruga. Facing south is another beautiful sculpture of Lord Shiva in the form of Dakshinamurthy, quietly enlightening the most learned of the sages. Facing west and therefore facing Vishnu Dhama, is a beautiful sculpture of Lord Ganesha. Facing North, is one of the most beautiful sculptures of Mother Parvathi in the form of Goddess Annapurneshwari. Bodhgaya – To the northeast of Kashi is a peaceful walkway called Bodh Gaya. One one side of this walkway is a exquisitely carved granite statue of Lord Buddha. This statue represents the stae of Lord Buddha when he has given up consumption of all food and was meditating for years. Therefore, this statue shows the bones and sinews of the Lord, all sculpted so well, that it indeed looks life-like. On the other side of the walkway are statues of the eight Bodhisattvas, including Lord Gautama Buddha. Kailash – To the north of Bodhgaya is Kailash. Set in verdant setting, under towering trees is the exquisitely carved statue of Lord Shiva in the form of Amrutha Mryuthyunjaya. In this, Lord Shiva, who has overcome time and death, is shown holding pots of Amrutha (nectar) and bathing in it.